Really built-in 1200+ games , the user can connect to the computer for inquiries. ISpecial Reminder: Many sellers say that their game console built in 10,000 games, this is not true. In fact only 100 games in the repeated display. Users can follow the game number to query. 4.3-inch screen.Built-in Rechargeable Lithium Battery.Games can be added or delected. 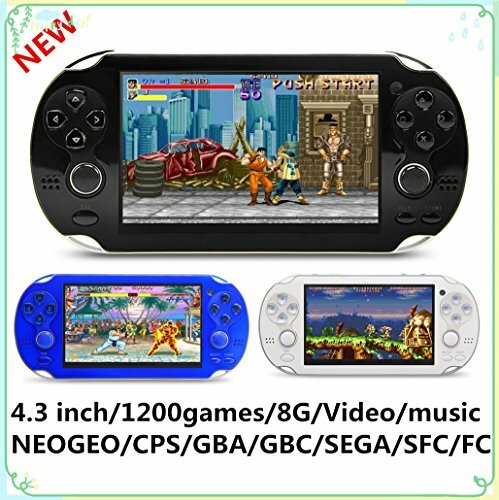 Support for ARCADE/NEOGEO/CPS/FC/NES/SFC/SNES/GBA/GBC/GB/SMC/SMD/SEGA format of Games, build in 1200+no-repeat games. Press "ESC" button, select "Save Game" can save the game progress（6 progress） and play again with last game progress.Games in the "Ext-Games" folder can be downloaded or deleted. About charging:When charging, push the HOLD button (next to the power button) to the right.charging time: 4-6 hours. Support MP3/MPE,DV and DC,Camera in-builded,AV-OUT.Calculator,Calendar,Stopwatch,Recorder,Download Function. If you have any questions about this product by CZT, contact us by completing and submitting the form below. If you are looking for a specif part number, please include it with your message.